This week, Facebook announced a new Shazam-like feature coming to its mobile app capable of automatically detecting what song you’re listening to or which television shows or movies you’re watching while writing status updates. The new feature has two purposes. The first is to make it easier to share what TV shows you’re watching with your friends. The second, of course, is to collect more data about you so you can be effectively advertised to. Facebook told the International Business Times that while “no sound is stored,” data about what you’re watching or listening to will be. “If a match is successfully made, the data is saved, but all data is anonymized and aggregated,” says Facebook spokesperson MoMo Zhao. 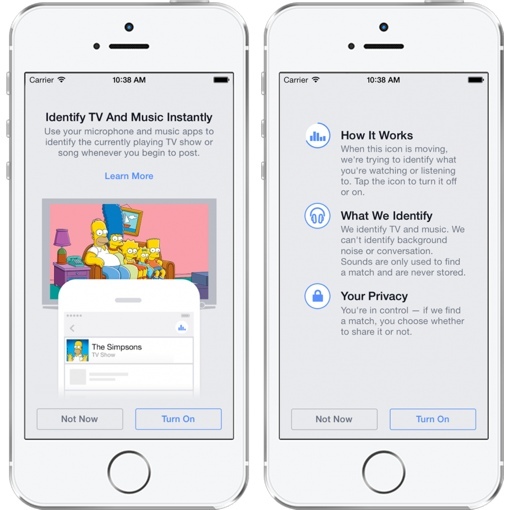 You can learn more about Facebook’s Music and TV Identification feature on the Facebook newsroom blog or by watching the short promo video below. For more on managing your Facebook data, check out our Comprehensive Guide to Facebook Privacy Settings. If I want my friends to know what I’m watching or listening to, I am very capable of typing it myself. Can’t they just use our interests as a guide to effective, targeted advertising? Maybe I’m just being ignorant, but this whole new eavesdropping seems excessive to me.